This post is on a movie called Pitch Perfect. This movie is very well known and one of my favourite movies to watch. 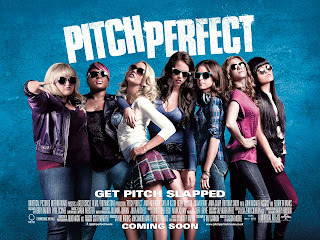 Pitch Perfect had actress Anna Kendrick who played Beca, Rebel Wilson who played Fat Amy, Brittany Snow who played Chloe, Skylar Astin who played Jesse, Anna Camp who played Aubrey and many others. Pitch Perfect was about 2 a cappella groups fighting against each other to win gold. In my opinion, this is the best movie I have watched so far. The story was excellent and the humor was amazing. If i were to give this movie a rating out of 10 I would say this movie deserves a 9.5/10. I gave this movie high marks because this movie was well written and directed because the scenes had a balance. It was not over funny where you get bored because the whole movie was just jokes, there was a balance between the the story and the humor. Also, the movie had amazing actors and actresses who were perfect for the roles because they did an amazing job. Overall I give this movie a 9.5/10 and I am super excited for the sequel which will be released in 2015!